If you fancy yourself as a farmer or want to live the country life, why not take a look at some iPhone and iPad farming game apps! Playing games on mobile devices is now a common pastime, and there are all sorts of genres available on Apple’s App Store. Who would have thought that farming games, in particular, would become so popular, although maybe it’s because many people find them a welcome escape from our fast-paced, busy lives? There’s something about a farming game that can be fun, relaxing and therapeutic but they can still be challenging at the same time. This means that many enjoyable hours can be spent absorbed in growing crops, harvesting, raising animals, planning farm buildings and more, as an escape from everyday life. Farming games can also be quite a social activity as many have the option to engage with friends and help them in their games too. There are plenty of farm game apps available in the App Store, and the best ones have great graphics, a wide variety of features and tools, and smooth gameplay. 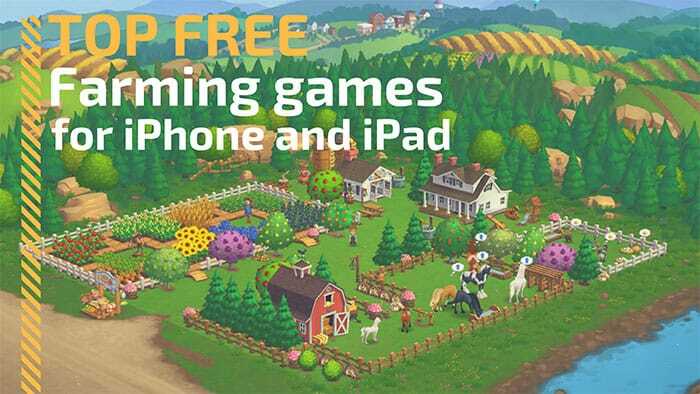 If you’ve often fancied becoming a farmer and taking to country life but haven’t yet got round to trying farming games, check out our choices of the best free farming games on iOS for iPhone and iPad. All of the apps below are free to download and use although they also contain in-app purchases for in-game currency or additional content. That’s something to be aware of, although some games lean more heavily on them than others. Even those people who have never played a farming game before will probably have heard the Farmville name. Its makers Zynga claim that Farmville 2 is the most popular farming game in the world, and after spending many happy hours playing it, we’re not going to argue with that! The game has appealing graphics, and you can play in Anonymous Mode or join a farm co-op to trade and share the fun with others. 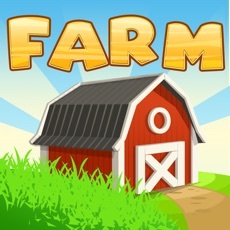 If you want to grow your own fresh crops, produce baked goods, customize your own farm, or look after farm animals, this game has just about everything you could want. It also features a Mystery Chest and a Prize Wheel for rewards. There’s plenty to recommend about Farmville 2: Country Escape and it’s easy to pick up thanks to an informative tutorial when you start playing. As we mentioned in our introduction, the game does offer in-app purchases, though we found there was plenty to enjoy without needing them. This farming game includes content that’s common to lots of these apps such as growing crops and harvesting. However, it’s a particularly good option for those who enjoy big machinery and want to imagine themselves as a tractor or harvester machine driver. It will be down to you to use your tractor and accessories to plow your fields, maintain the crops, and harvest them on time, and your aim is to pass through different levels until you become a pro tractor farm driver. This game has user-friendly controls, and you control your vehicle by tilting or using arrows, control steering by tapping your iPhone or iPad on the left side, and drive or brake by tapping the device on the right side. 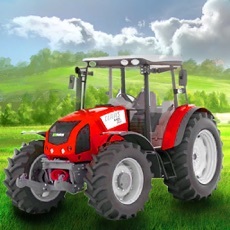 Tractor Simulator benefits from stunning graphics, and step-by-step tutorials so do check it out. 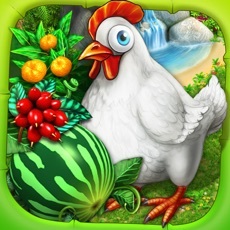 This iOS farm game has a high user rating of 4.6/5 stars on the App Store, and we can see why. Strangely enough, on this farm, it’s always sunny and never rains, and we love the very cutely designed farm animals. Nice touches with Hay Day include a roadside shop where you can trade goods and crops with friends and neighbors, a fishing dock, and using your truck (or steamboat!) to deliver orders. The game has pleasing artwork, and there’s less pressure to keep playing than other similar games, as your crops will never die! This game can only be played online, but if that’s fine with you, it has plenty to offer. You can play with friends, and the game has a massive variety of fruits, vegetables, and flowers to plant, over 150 in fact. It’s fun to build your farm, and you can adorn it with other farm buildings, fences, and trees, and when you have time, you can visit your neighbor’s farms to see how they’re getting on. New updates are added every week, and if you want to show friends your progress you can share pictures of your farm on Facebook. You may have heard of this game under its previous title of Farm Away! It’s an extremely popular easy-to-play game among farm game addicts, and the aim is to get rich by making the most profitable farming empire. 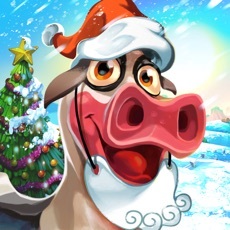 The game has cartoon-like graphics, and you’ll need to make wise investments in animals and crops to take your farm along the right tracks. Hundreds of crops and animals are available to collect, and a different touch with this one is the ability to control the weather to optimize production. If you get the development of your farm down to perfection, you’ll even be raking in the gold when offline, giving you the opportunity to chill out once in a while. 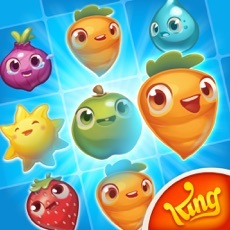 Farm Heroes Saga comes from King, the makers of the smash hit Candy Crush Saga. It has a different approach to many other farming games, as it’s a puzzle game format, and while it’s fun, there’s a bit more emphasis than usual on in-app purchases. The aim is to match Cropsies, but a raccoon dubbed Rancid will be trying his very best to thwart you. There are hundreds of levels to play in a bid to win magic beans, and you can play solo or with friends. Every two weeks more levels are added, and features include rechargeable boosters, power-ups, leaderboards to see how well you’re competing against your friends, and more. The game is easy to pick up and becomes increasingly challenging so it can easily become addictive. The brightly colored graphics of this game are visually stimulating, and there are plenty of characters that will keep you entertained as you play. You can build on your land and expand your farm just the way you wish, and friends are welcome to visit, or you can visit their farms instead. The game is strong on the environment, as it emphasizes growing organic crops and using 100% clean energy. With Top Farm, you can sign in with Facebook, and additionally, the app enables you to save your progress across multiple devices. With a name like Township, you could be forgiven for thinking that we’ve mistakenly included this as a farming game. However, that’s not the case as this Playrix Game app combines the best of farming and city building to offer something a little different from the norm. To get the best out of Township, you’ll need an Internet connection for social interaction, competitions, and additional features. The game aims to grow and harvest crops, process them at your factories, and then sell them in order to enlarge your town. That means you’ll then be able to open town facilities and amenities including cinemas and restaurants. You even get to run a zoo, and there’s also a mine to explore where you can look for ancient artifacts. We wanted to include this in our look at the best free farming games on iOS as it offers a very chilled approach with a relaxed game mode. The game features Jill who has been fortunate enough to build a farm on an exotic island, so rather than the standard fruit you might farm, there are more exotic fruits available. The laid-back farming style involves building handmade machines on the beach and looking after free-roaming animals, and you’ll have your pick of farm staff to help out, as well as dozens of machines. The game has 35 achievements and 100 fun playing levels. We really enjoyed playing this game that’s set in the 1930s and based around Jennifer, a young woman who has just purchased a farm. It’s a real family business as her husband and grandparents are helping in the hope of making a thriving farming business that will help the economy of the country. You can customize the farm, build factories, and receive quests from other local farmers, and the game also features an interactive global map. It’s a beautiful looking game that’s well worth taking a look at, and if you want to play it with others you can add them on Facebook. We admit we were surprised at just how many free farming games were available for iPhone and iPad, although it’s been a pleasure trying out so many. The top choices that made it to our best free farming games on the iOS list include a wide variety of features, different styles, and different levels of gameplay, and we’ve tried to include some games that offer a different approach or unique features. Like many available gaming apps, some people might be deterred by the appearance of in-app purchases, but these all offer plenty to enjoy without having to splash the cash so don’t be put off. If you try out any of these farm games for iOS, we’d appreciate your comments to tell us which you enjoyed the most.